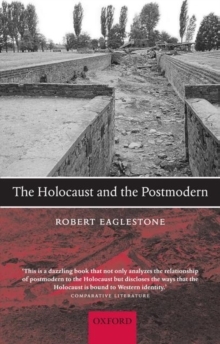 Robert Eaglestone argues that postmodernism, especially understood in the light of the work of Emmanuel Levinas and Jacques Derrida, is a response to the Holocaust. This way of thinking offers new perspectives on Holocaust testimony, literature, historiography, and post-Holocaust philosophy. While postmodernism is often derided for being either playful and superficial or obscure and elitist, Eaglestone argues and demonstrates its commitment both to the past and toethics. Dealing with Holocaust testimony, including the work of Primo Levi and Eli Wiesel, with the memoirs of 'second generation' survivors and with recent Holocaust literature, including Anne Michael's Fugitive Pieces, Jonathan Safran Foer's Everything is Illuminated and the false memoir of Benjamin Wilkomirski, The Holocaust and the Postmodern proposes a new way of reading both Holocaust testimony and Holocaust fiction. Through an exploration of Holocaust historiography,the book offers a new approach to debates over truth and memory. Eaglestone argues for the central importance of the Holocaust in understanding the work of Emmanuel Levinas and Jacques Derrida, and goes on to explore what the Holocaust means for rationality, ethics, and for the idea of what it is to be human. Weaving togethertheory and practice, testimony, literature, history, philosophy, and Holocaust studies, this interdisciplinary book is the first to explore in detail the significance of the Holocaust for postmodernism, and the significance of postmodernism for understanding the Holocaust.